KAH Tequila Reposado is an ultra smooth, and ultra high-proof Tequila with a full body, and intense Agave favor. It is aged for ten months in French limousine casks, where it acquires subtle hints of vanilla and caramel. 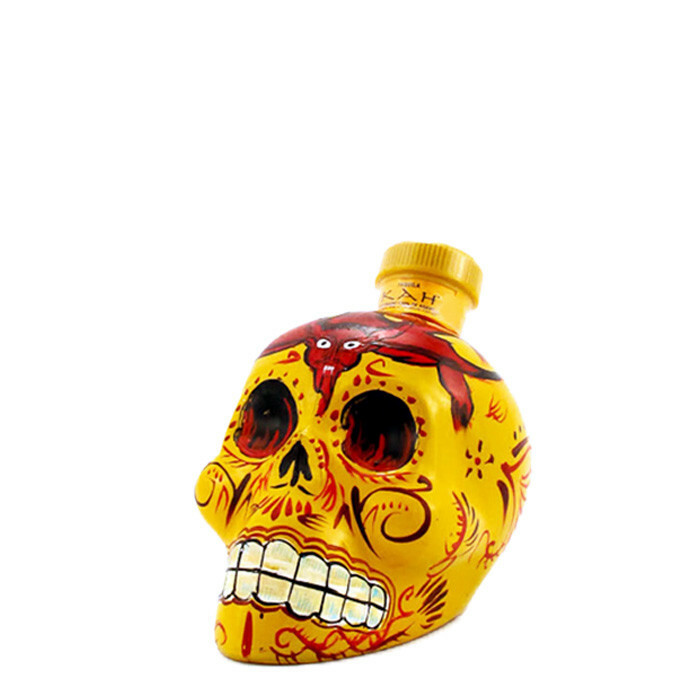 The KAH Tequila Reposado bottle is painted as "El Diablo". The use of devil imagery was inspired by Day of the Dead celebrations in Peru. The festival takes place the week before November 5th on the banks of Lake Titicaca, The traditional dances (complete with dangling red crucifixes) are rumored to be led by the devil himself. Traditional dances are dedicated to Satan. This region of Peru is mostly a mining area and workers spend much time underground. According to ancient Incan beliefs, Satan lives underground making the miners vulnerable to his powers due to their daily proximity. The festival is designed to honor Satan, thus keeping the workers safe. The even pour Tequila on the ground for the devil to drink. KAH® was designed to pay reverence and honor to Mexico and its people. Its bottleand spirit are reflective of Day of the Dead, the 3,000 year-old Meso-American ritual honoring deceased loved ones. KAH’s unique packaging, in turn, is inspired by traditional Calaveras used in Dia de los Muertos rituals to symbolize death and rebirth. The word KAH translates to “life” in the ancient Mayan language.